In this second volume, Captive Heart, where the fledgling colony is beset by brutal bandits and a deadly epidemic, Jake risks his soul to shows his love for Rachel. Her sister Miriam is torn by the forbidden feelings she has for Domingo, their Mexican hired hand. Domingo is drawn to Caleb Bender’s deep faith, but respects the fences that faith puts between him and the young woman he has loved from the moment he saw her. 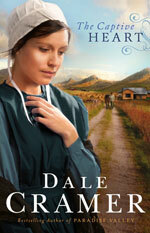 Dale Cramer is one of my favorite Christian writers. I can easily lose myself in his vivid setting, story and complex characters. Bender’s mentally-challenged, eldest daughter Ada is especially compelling when she, who has always been a child although her body is grown, must help someone who is weaker and more helpless than herself in a desperate, life-threatening situation. There are several things that disturb me here theologically. First the idea that sin is no big deal; I can always repent later. (I have heard that idea expressed in regard to sexual sin.) Admitedly, Micah is presented as a weak man, not one Cramer would have us emulate. Later in the book when killing does take place, the author makes a strong case that things are not so simple. Even with repentance, sin leaves deep scars and consequences. The second problem I have is with Ira Shrock’s assumption that God will condemn for all eternity based on a single act of self-defense, or in this case, defense of the vulnerable. But if he does believe this (which according to Cramer the Amish do), how can he ask someone else to go to hell for him? The peaceful way of life the Amish seek depends on someone else using physical force and even violence to protect them from godless bandits. I long for Cramer to delve more deeply into this subject that is the crux, not only of Amish existence in 1920s Mexico, but of my own existence in post 9/11 America. Jesus Christ taught us to turn the other cheek. He died to reconcile us to God and to each other, but in Nigeria Christians are finding that turning the other cheek only leads to getting that one slapped as well while their churches are burned and their families murdered. It is a subject that merits more than a sub-theme in a bonnet romance. I have met Dale Cramer; I am impressed with his mind and with his perceptions of the real world, not to mention his skill with words. He does not pretend to resolve these issues in this book. Captive Heart will be enthusiastically received by readers of historical romance, but I am hoping that the next volume will give me more substance to grapple with.